From the 1770s onwards, tourists travelled to the Lake District in ever increasing numbers, creating what one writer called a ‘Rage for the Lakes’. 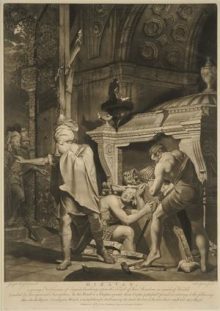 Many painted and drew their own response to the glorious scenery, while others bought works from the professional artists who followed in their wake. 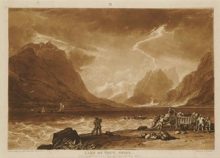 This exhibition will bring together forty drawings and watercolours of Lake District views dating from 1770 to the end of the nineteenth century, from the outstanding collection held by the Lakeland Arts Trust at Abbot Hall Art Gallery in Kendal. 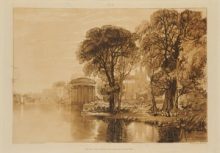 It will feature exceptional works by John Constable, John Robert Cozens, Thomas Hearne, Joseph Wright of Derby and two fine watercolours by JMW Turner, including his view of Lake Windermere from 1821. 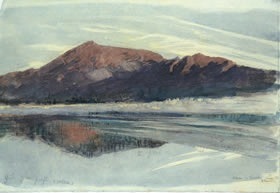 There are also important groups of drawings by Edward Lear, including works from his 1836 tour, and by the great art critic and amateur artist John Ruskin, who made his home on Lake Coniston. Among the works by amateur artists are enchanting examples by John Harden, with whom Constable stayed on his 1806 trip to the Lakes, and lesser-known – but highly talented – artists such as Henrietta Ann Fortescue. The variety of scenery depicted is great, ranging from the hills and mountains of the region, its lakes and waterfalls, to the picturesque ruins and cottages. It provides the perfect visual accompaniment to the poetry and prose that are so intimately associated with the region, from Wordsworth to Coleridge. 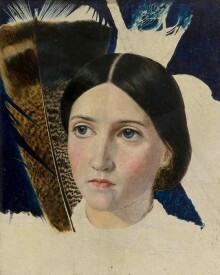 Above Image: John Ruskin, Dawn, Coniston, 1873, (detail). © Lakeland Arts Trust.